The timing belt keeps the engine crankshaft and camshaft synchronized so the engine can run properly. 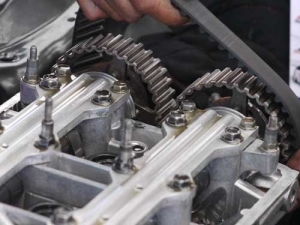 The timing belt is a device that connects your engine’s crankshaft and camshaft, to keep them properly synchronized with one another. A degree off one way or the other, and your car’s engine could lose power, waste gas, and suffer general performance problems. And, if the timing belt breaks, it’ll leave you stranded. Worse, still, on some engines it can allow the pistons in the engine to hit the valves, causing additional internal engine damage. So there’s little doubt that replacing the timing belt occasionally is a valuable maintenance service. In addition, many of those items that have to be removed are also normal-wear items, such as fan belts and the water pump. So it just makes sense to change them all at the same time, since you’ll only pay for the labor once. The technicians at Cottman are very familiar with the ins and outs of timing belt replacement. They know what components are in the way, and they can recommend exactly which additional items to replace to save you the most money, while providing you with the dependability you expect from your car. If you have any questions about your car’s timing belt, or would like to schedule an appointment to have it checked or replaced, find your local Cottman center. Don’t wait; do it today!